Dallas Allison (and his beard) is responsible for getting the Prince Rupert Ground Search and Rescue team back. He spends much of time training towards his goal of being one of the few to run up Mount Hays in less than 40 minutes. Three years ago he decided it was time to get comfortable being uncomfortable and the entire community benefited. 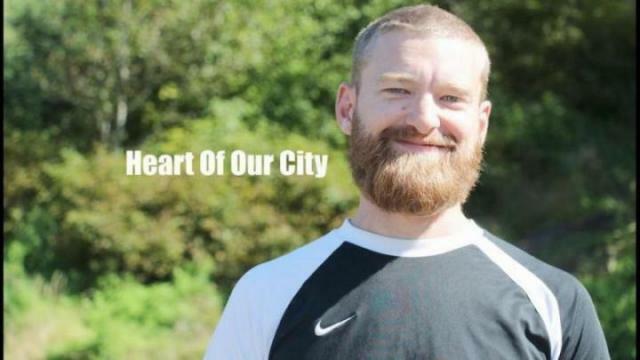 Dallas Allison is known for his fiery beard and for bringing the Prince Rupert Ground Search and Rescue team back on its feet and soon he may be known for one of the few who are able to break the 40 minute mark for running up Mount Hays. He has made it his mission to break out of a rut by volunteering, signing up for musicals, coaching his son and taking advantage of the North Coast nature. The flatlander grew up in Regina, and then moved to Prince George 10 years ago when he started working for CN. An opportunity came up in Prince Rupert, and the love of the ocean drew him to take a chance on a new place. “Little did I know it was even more amazing,” he said. He recently went on a solo kayaking trip to the Khutzeymateen from Prince Rupert and tackled 193 km in four days. “I got the closest I will ever be to three cubs and a sow, sitting in a kayak, right on shore about 20-30 feet away. It was incredible,” Allison said. His search and rescue training and tracking skills kept him sharp to avoid confrontation with grizzlies on land when he camped overnight. “I think bears are the least dangerous part of the solo kayak trip. A little bit of inattention, you dump your kayak when it’s fully loaded in the middle of some crappy weather it can turn sour really quick,” he said. All his solo kayak tours, and the odd misadventure, has helped him understand the mindset of someone who is lost in the wilderness. Three years ago, Allison joined a search for two mushroom pickers in the Terrace region. When he stepped forward to help he thought he’d join the Prince Rupert Search and Rescue (SAR) but he discovered the team had disbanded some seven years back. He helped revive Ground SAR and is now the only manager, but he’s looking for more team leaders in the community. There are approximately 20 members now, and they are looking for at least another 10 to join in the fall. Ground SAR recently got a $25,000 boost from the province and Allison hinted at another big announcement coming soon, which will help fund his ambitions to have a command centre and more training equipment and courses available to members. Around the same time Allison stood up Ground SAR, he also joined the Canadian Rangers, an army reserve for the more rural coastal and northern regions of the country. His aim was to learn how the Rangers worked as a society and to network the two groups. “We are the eyes and ears of the north,” he said. To be a better SAR member and leader he has taken all the SAR certifications he can, including the JIBC Search and Rescue Manager certificate, swift water rescue, military and marine first aid, tracking and navigation skills. He also volunteers on behalf of SAR and was seen setting up tents on Canada Day and manning a relay station during the Skeena River Relay. Other ways he’s embraced being uncomfortable was participating in a community run musical at the Lester Centre of the Arts. He was in “Les Miserables” the same year he started Ground SAR. He also wore a dress — with the beard — in the Mz. Judged event, a beauty pageant and a fundraiser for the North Coast Transition Society. In the centre of all his volunteer activities and the whole reason he dedicates himself to SAR, is his 11-year-old son Austin. There have been some tough calls he’s experienced as a SAR member, but it’s also been eye opening. If his son ever went missing, he’d want to know that the RCMP had a team of skilled people as additional resources. “I have to find a balance between work, my volunteer activities and spending time with him and for a lot of years I used it as an excuse not to do anything then I realized that even as a full-time parent I need to show him that you can chase whatever you want, no matter your circumstances,” he said. Right now, Allison is chasing the top of Mount Hays, and often multiple times a week. This is the first race he’s signed up for and he plans on hitting 40 minutes, but with his determination he may just shave a few seconds off his goal. He started training two months ago, originally to be a better search and rescue member, a better Canadian Ranger and to get in tip top shape. At first, he wore a 50-60lb backpack and carried the extra weight up the mountain. His best time a week ago was 43 minutes, and that’s without the adrenaline of race day.